Is it a side salad or a dessert salad? It’s either! Watergate Salad breaks all the rules. It’s a crazy delicious concoction of pistachio pudding, Cool Whip, pineapple, and marshmallows. Watergate Salad is a retro dessert that is both fun and tasty. Set some Watergate Salad out at your next Potluck and watch it disappear. It’s also a great salad to include for your Easter Meal. 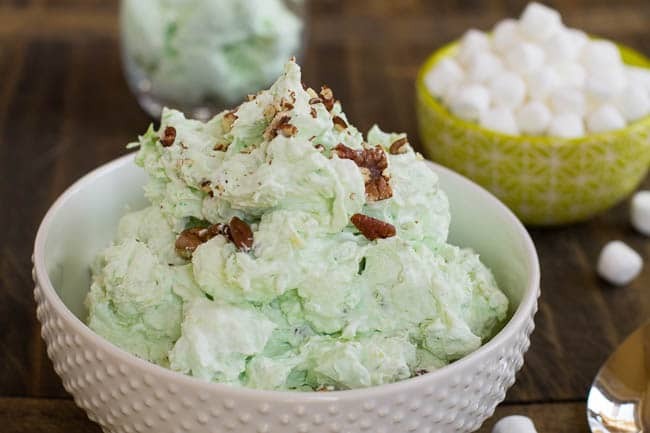 Most people either grew up with Watergate Salad or they don’t know what in tarnation it is. If you grew up in the south, you probably had a grandmother who made it for every special occasion or church luncheon. 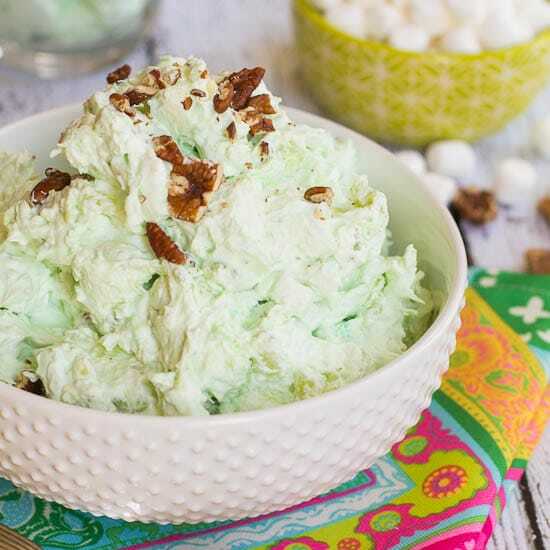 Watergate Salad was originally developed by Kraft under the name Pineapple Pistachio Delight in 1975 when they first introduced pistachio pudding. The pistachio pudding gives it its characteristic mint green color and a good bit of its flavor. It is affectionately known as “Green Stuff” to many people. If you’ve never had Watergate Salad, be prepared. It has a wild and crazy texture with tons of contrasts. The cool whip makes it a little airy and light, but there are small chunks of pineapple and a crunch from the pecans, giving your teeth a little something to sink into. And of course the marshmallows really stand out with their completely distinct soft but a little chewy texture. Once your senses get over the craziness of it all, you’ll discover that it is really quite delicious. 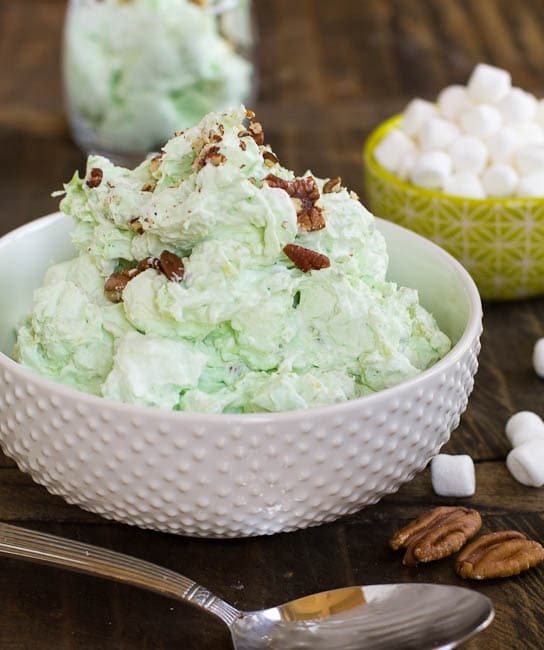 Watergate Salad is a dessert salad that tends to be appealing any time of year. Its light texture lends itself to the warm weather months, but throw a cherry on top and you have a perfectly festive red and green treat for Christmas. And of course its pastel color is fantastically fitting for Easter. Is it a side salad or a dessert salad? It's either! Watergate Salad breaks all the rules. It's a crazy concoction of pistachio pudding, Cool Whip, pineapple, and marshmallows. In a medium bowl, stir together the full contents of the pineapple cans and the pudding mix until smooth. Fold in whipped topping and marshmallows. Cover and refrigerate at least 1 hour. Sprinkle pecans on top before serving. This entry was posted in Desserts, Salads and tagged pineapple, pistachios, retro recipes, watergate salad. Bookmark the permalink. Ours is a little different. We use the sugar free pistachio pudding, small curd cottage cheese, sugar free non-dairy topping (cool whip), unsweetened crushed pineapple in pineapple juice and a cip of minature marshmallows. Wish I could figure out the calories! Back in the 1980’s I learned of a salad similar to this one. Only it was using Peach Pudding (similar to the Pistachio Pudding), Cottage Cheese, Whipped Cream, Mini Marshmallows, and the canned Fruit Salad (drained I think). It was such a pleasure to eat also. Haven’t made it in years but this Watergate Salad sounds heavenly…must try it soon! Thanks!! My family calls it “the crack salad”. Addictive . I make pudding as box directions, less about a 1/4 c milk. I prefer it a bit thicker, and dice up apples instead of pineapples, it seems to keep longer too. Also use the fruit flavored colored mini-mallows. Mix pecans sometimes walnuts and occasionally sweetened shreds of coconut into mixture with the whipped topping. I LOVE IT! MY children have issues with the textures and oddly enough state the mallows as their LEAST enjoyable part! More for my guilty pleasure at midnight.. I omit the pineapple usually. Use diced apple, mix in pecans or walnuts, sometimes both. I prefer the mini fruit flavored colored mallows , sometimes i add coconut too! My family always made what we called “The Green Stuff,” and yes the recipe I have is actually titled that. It is very similar to this, except it is made with a large box of Lime Jello instead of pistachio pudding, so it must be cooked. Instead of marshmallows, you add 1 container of cottage cheese. The other instructions and ingredients are identical. We have loved it for as long as I can remember. No, just pour the box of pudding into the crushed pineapple with juice and mix until smooth. Just in time for me to make and take to a St. Patrick’s Day dinner. Now I just have to make up my mind which version to make. Maybe both? Thanks for the tip about the metal bowls! What was the tip about metal bowls? This was my first time making this kind of salad. This recipe is fast, easy and SUPER YUMMY!! I would like to have the recipe that’s made with lime Jello and cottage cheese and pineapple can you send it to me. My mom makes this often. It is delicious. A word of advice: Do not prepare this in a metal bowl or use metal utensils. The salad will turn brown. Speaking from personal experience. We make green stuff. It’s like jello,Cream cheese whipping cream,pineapple and marshmellows. It turns out more like a parfait. Old family holiday tradition. I believe the true name is Heavenly Hash. Do you have the recipe for the Heavenly Hash mentioned above by Rikki Johnson? I and my whole family loved your Watergate salad. Thank you for sharing! I have been eating this since I was a child, making it for my family, they are now making it for their families! Wonderful Salad. My “Green Stuff” is very similar but I use the Kraft FunMellows and add maraschino cherries! There are never any leftovers! Cherries really make it !! Just like my mom used to make! I’ll be making it for Easter this weekend. Hope you have a wonderful Easter Karen! Just made this for today. My husband and daughter have never had it. I’m ashamed to admit I’ve never made it for them before, having grown up with it on our dinner table at all the holidays. The new tradition starts. Yay! So glad you have started a new tradition. I bet your daughter will be making it years from now. I grew up in arcata too. Does anyone have the nutritional information or how many weight watchers smart points it has ? Does anyone know the nutritional information or how many weight watchers smart points it has? Does anyone have the nutritional information or how many weight watchers smart points it has? We make this and add coconut and don’t use marshmellos…….i promise it will disappear!!!! How much coconut do you use? It is heavenly. 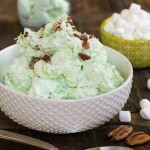 I love Watergate salad and make this every Easter and Christmas and sometimes on Thanksgiving because it is as easy to make as it is delicious! One of my daughters does not like nuts so I make a bowl with nuts and one without. My mother-in-law makes a version with lime jello and cottage cheese but I personally prefer the pistachio pudding and cool whip! There was also a cake – recipe card in Mother’s recipe box – that I loved. Just delicious! Maybe it was invented in the 1970s. Some recipes call for drained pineapple,,do I drain the cans before blending with jello? I do not drain the pineapple Betty. We make this with 1 1/2 cups of cottage cheese instead of marshmellows. Because my daughter is allergic to nuts I sometimes make it with cheesecake flavored pudding instead of pistachio and add a can of mandrin oranges (drained). Its all good! If you substituted the cheesecake flavor and used the pineapple, I wonder if you could add coconut instead of marshmallows? I do and it tastes great! I totally grew up with this and LOVED it, but we called it something different, I can’ even remember what it was. Regardless, this looks SO yummy and totally takes me back. I have never had (or heard of!) watergate salad before! But I am smitten with that pretty green color! Pistachio anything is such a favorite of mine! I am pretty sure I would LOVE this fun & retro salad. I’ve heard of ambrosia salad but this is definitely new to me. I love learning about regional foods and new things in general. I didn’t even know there was instant pistachio pudding out there either! So much to learn. This would be a pretty dish to set out for Easter. Oh my goodness this recipe takes me back! I have not had one of these since childhood, it will make the perfect Easter dessert for sure! Plus it’s sounds really easy to prepare! I have never had such dessert before! It sounds like a very delicious combination of flavors!